Leytenant Ivanov swung the cupola of his Valentine, checking that his company were keeping up, their line extending left and right. Valentine, the name always made him think of his little Valentina waiting for him back home. She'd laugh to think this odd-looking English tank had her name. Off to the left, earth fountained amidst the smoke shrouding the village as tanks and artillery pounded the Germans within it. Another village sacrificed to the Motherland, to the war to expel the invaders. The Valentines ploughed on, turrets traversed to watch the village, catching a glimpse now of the bigger T-34s racing towards it. A German gun somewhere in the village was working its deadly trade. At least two tanks had careened to a halt, burning. Closer now, and Ivanov could see the German infantry starting to run from the back of the village as the remaining Soviet tanks entered from the front. 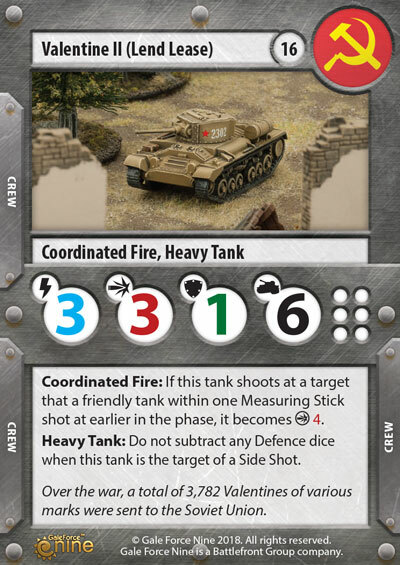 There are quite a few Lend-Lease tanks for the Soviets in our upcoming releases. Ranging from light Stuarts to heavy Churchill tanks. 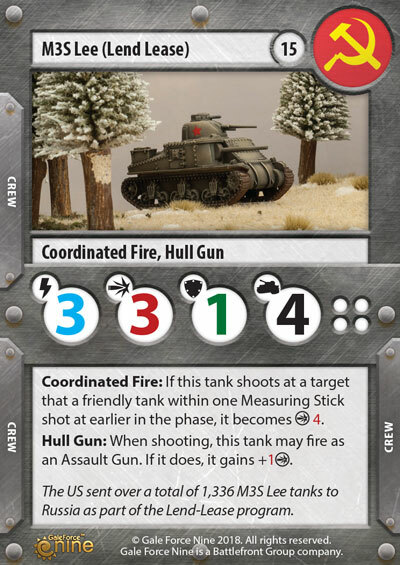 Soviet players now have plenty of new options when creating their platoons. 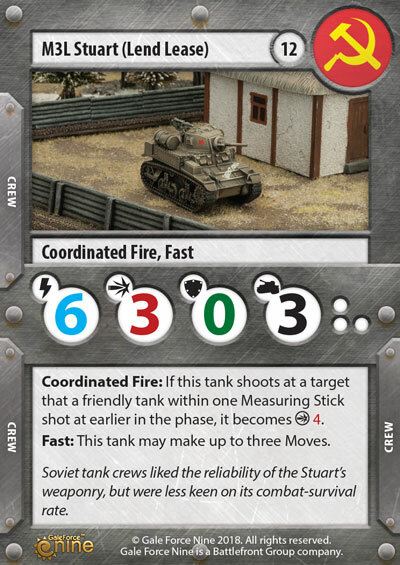 The Stuart (Lend Lease) gives the Soviet players a light cheap tank that can swarm enemy tanks. Coming in at only 12 points it is easy to fit this tank into any platoon. Creating a list with only Stuarts gives you 8 of these light tanks with some points to spare for some Upgrades. If you are looking for something cheap with a little more staying power then the Stuart then look no further than the Lee (Lend Lease). At only 15 points you can still fit 6 of these tanks in your list and you will still have 10 points left over for Crew and Upgrades. Whilst in Soviet service the Lee tank picked up a few nicknames and was not entirely popular with crews due to its tendency to burn easily. 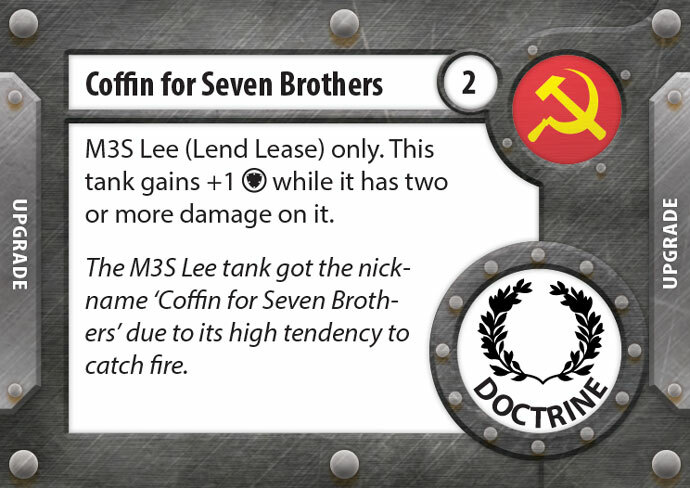 “Coffin for Seven Brothers” (as the tank had space for seven crew) was one of the most notable and in TANKS this card gives your Lee an extra point of Defence once it is down to 2 damage points. Of course, this means you have to have survived the initial damage.. The Americans were not the only people to send the Soviet Union lend lease equipment during the war. The British also sent over a great deal of support. The Valentine tank was well liked by Soviet tankers as it was much more survivable than a Stuart whilst still being considered as light. The Valentine II gives you a little more survivability with a decent gun and Defence, whereas the Valentine VIII gives you a bit more firepower at the cost of one less point of Damage Capacity. 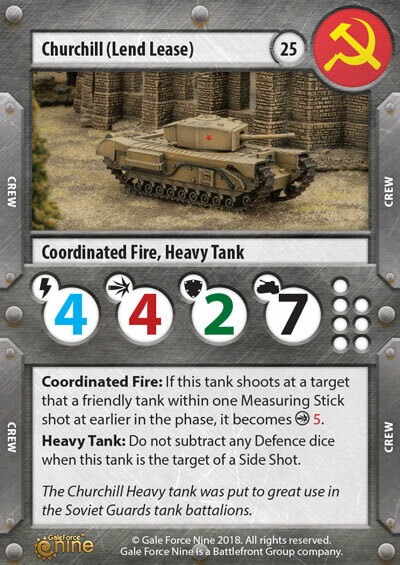 Lastly, we have the Churchill, these heavy tanks just look awesome. 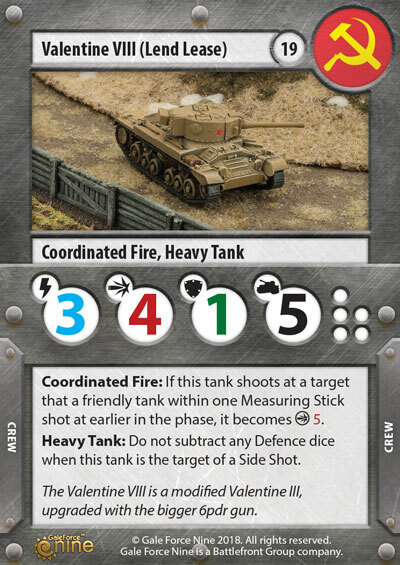 With a good gun, great defence and 7 Damage Capacity this tank can give as good as it can take. 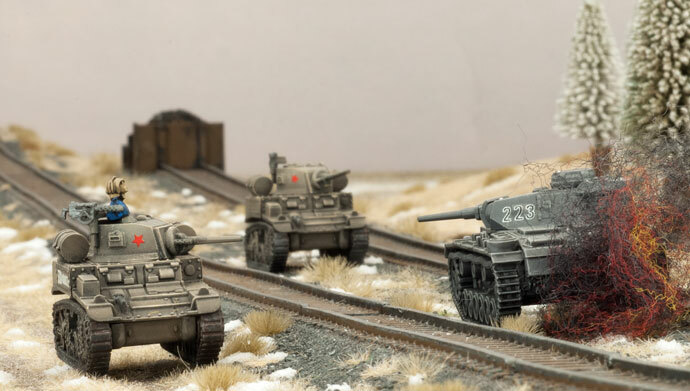 These new Lend Lease Soviet tanks, along with more will be in gaming stores soon!